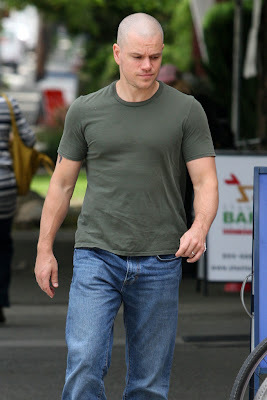 Bald Matt Damon - Rockin the Shaved Head Proudly [Photos] - T.V.S.T. 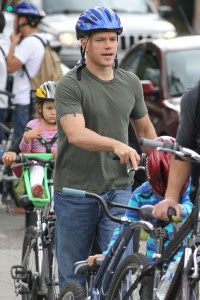 Matt Damon went for a bike ride with the family amidst filming his newest sci-fi flick Elysium. The film’s exact plot costarring Jodie foster, has been very tight lipped. 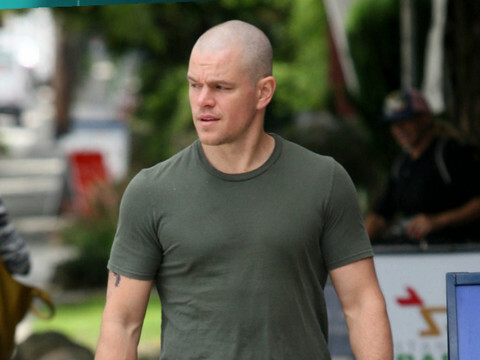 All we know is that it takes place in the future on another planet and stars a Bald Matt Damon. He looks MUCH better without hair. I’ve never thought he was handsome or saw his appeal. But shaved? Holy cr&p, that boy looks good! Hubba hubba – note to Ben Affleck , bald can look good !! !